On your way someplace else, how many times have you passed a sign pointing to a small town airport? The more important question is how many times have you followed that sign? With the potential for unknown delays between the sign and your intended destination, and the unlikely reward of aviation serendipity, of finding something interesting at a small airport in these aviation depressed times, you probably drive on by. Yeah, me, too. But not this year, or in all the years to follow. Finding something special is worth the minutes it takes to follow the airport sign and make a drive-by inspection. If there is nothing that captures my curiosity, I’ll be on my way. But if it is taken prisoner, what else can I do but surrender to it? A visit to the municipal airport, with a single 4,400-foot runway, that serves the 11,639 residents of Urbana, Ohio, planted the seed for this change. 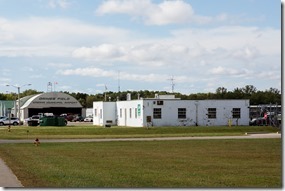 Had I been traveling and not touring the National Aviation Heritage Area, I would have missed something truly unique, the Champaign Aviation Museum, which calls this small town airport, also known as Grimes Field, home. What makes the Champaign Aviation Museum unique is not the B-17, named Champaign Lady, it is restoring to flight status by connecting the parts of five different Flying Fortress airframes with new construction. Nor is it the company of volunteers who are doing this good work. What’s unique is that museum visitors can watch them work, up close and personal. 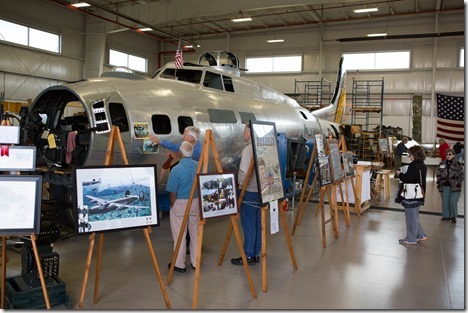 At most aviation museums, if the restoration shop is open to the public, admission is usually an added fee and visitors are kept at a distance. At the small museum at the Urbana Municipal Airport, the restoration shop is the primary exhibit. Open Tuesday through Saturday, there is no admission, period. Naturally, there’s much more to the museum, but what captured my curiosity was talking to the volunteers doing the work. From one I learned that one of the B-17’s sections was a set for the 12 O’clock High TV series, with big holes cut into it so cameras could film the waist gunners. The tail came from a B-17 drone the military flew through radioactive clouds after nuclear weapons tests. And the nose section came from the B-17 Allison used as an engine test bed. And if I had driven by this small town airport, I wouldn’t have met Irv Bence (I hope I got your name right), a volunteer since 2008, who was building wooden ammo boxes for the tail guns. 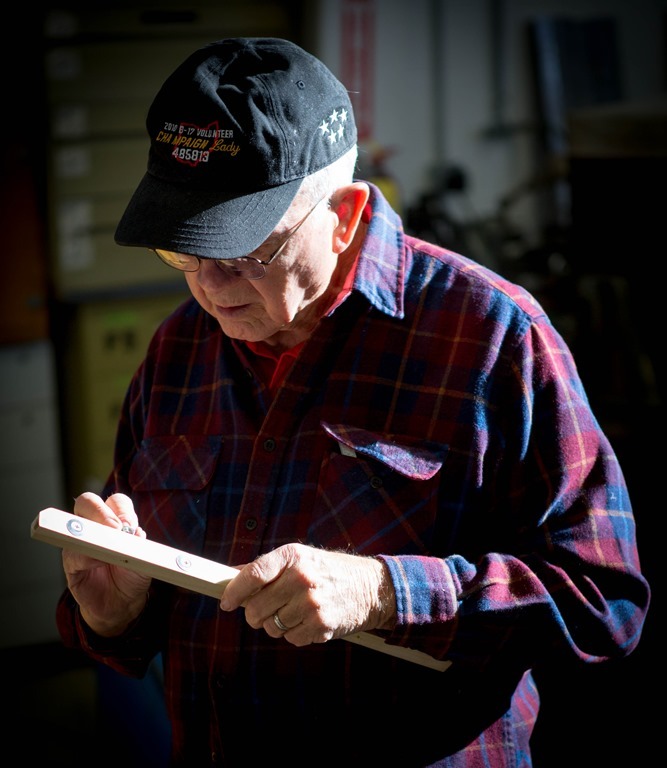 An engineer, he started work at Rockwell International in Columbus, and during his career he worked on naval aircraft, including the A-3 and A-5 Vigilante. Our far ranging conversation about this aviation era was priceless. This entry was posted on Monday, January 4th, 2016 at 12:43 am	and is filed under Airports, Aviation Education, Aviation History, Aviation Marketing, Blogging, Flight Training, Military. You can follow any responses to this entry through the RSS 2.0 feed. Both comments and pings are currently closed. Doing the RAGBRAI bike ride back in the 90’s where there seemed to be a small airport every 10 or 15 miles. Of course when its 90 degrees and you are cycling 500 miles, its not hard to decide to stop for a few minutes every little while! Meet a lot of great folks and saw a bunch of interesting airplanes. The other stop was while doing Cycle Viet Nam bicycle ride from Hanoi to Saigon in 1994. Another fellow on the ride was also a pilot (and lawyer) and we found that the town of Dalat had an airport that looked interesting on the WAC chart I carried to plan my ride strategy in the mountains. We had stopped at a number of former USAF airfields such as Phan Rang and Da Nang. Dalat was a civilian field, built by the French in the 30’s and apparently had not had any improvements since then. The tower and Quonset hut shaped brick hangers looked like they were used as the set for the airport in the movie Casablanca. Through a lot of persistence and persuasiveness I managed to talk our way into a visit to the control tower. The airport had one scheduled flight a week (a Da Nang/Dalat/Da Nang trip)and no apparent GA activity – a really minimal level of activity at the airport. As we climbed the six or so flights of stairs to the tower, we first passed a very large room that was being used as a barracks for perhaps 100 Vietnamese Army and in the tower cab was a single controller that, after a bit of apprehensiveness, opened up and was quite cordial and excited to show us around. The ICAO mandated tower voice recording was a $10 Sanyo personal memo recorder with a plug in the audio input, a twisted pair wire leading to two clip leads. These leads went to an ATC radio that had the cover partially removed to allow the wires into the radio. The wires were connected to the speaker of the vacuum tube aviation radio receiver that had a data plate showing it was constructed for the U.S. CAA in the Bronx, NY in 1938 – 56 years before! We surveyed the landing and ramp areas and asked a bunch of questions about aviation in Viet Nam and were treated very cordially. The cordiality continued until I saw an approach plate for the one Instrument Approach Procedure – an NDB approach. It wasn’t in Jeppesen form, rather it was rather simply drawn graphic with symbology completely different from anything I had ever seen. It probably was the original French designed approach from the ’30s. When I picked it up to look at it, the controller got pretty nasty, grabbed it from me, accused us of being spies and demanded we leave IMMEDIATELY! Since this was about a year and a half before the US re-established diplomatic relations with Viet Nam (we didn’t even reestablish a US Liaison office until about 5 months after our trip) we decided a hasty retreat was the best course of action. Based on his reaction, knowledge of a 60 year old NDB approach was apparently key the security of the whole country! All in all, it was a great roadside stop for an airport sign. I do regret not being able to get any pictures of the 1930’s vintage terminal, maintenance and operations hangars and tower as they were really classic airport architecture of an operational airport that was frozen in time. When their is no infrastructure to support it. If you are in New Hampshire, please do stop on by Boire Field. GA is alive and well here with six flight schools and over 240 based aircraft. I would be happy to provide a tour myself! I drove from California to Virginia in 1988 when I was transferred to a new job, and I made it a point to swing by every little airport I saw along the way. I occasionally got lost when following the signs produced nothing but confusion but mostly it was a series of pleasant experiences. When I moved from Virginia to Florida in 1993, and began making trips twice a year or more between I also sought out little airfields along the way, even diverting from my usual course a bit in order to see a new one. Admittedly, it’s not as much fun as actually cranking up your airplane and visiting a new little field but it can make long drives a little more interesting. And besides, you need to go somewhere to use the bathroom, anyway. I’ve done multiple trips from coast to coast by car and motorcycle, and always favored checking out small airfields in hopes there would be still be a meal available. There was, in the 1970s, often enough to make the risk worthwhile. Today, not so much – but if we all consider it a mission to help fields survive, then we can make a difference! It’s a shame. So many of the smaller GA airports being closed by the politicians. Our local airport was closed to move it to the much larger closed USAF base, but in the process, eliminated the only local instructor and rental fleet. Now, to just go for a joy flight, have to leave the state, go to a bigger airport for rental planes, and pay a lot more for the simple joy of aviating for fun.